SAN FRANCISCO, CA--(Marketwired - Jul 10, 2013) - Imprev today announced the invention of the real estate industry's first "App Generator" that enables real estate agents to create an array of branded mobile apps to give away to home buyers and sellers. Powered by the Imprev Marketing Platform, the App Generator has the ability to produce both stand-alone consumer Web Apps for smart phones and tablets including iPhones, iPads and Android devices, as well as apps inside websites. Branded apps produced by the App Generator are designed to keep agents top-of-mind by delivering high-value information to home buyers, sellers and prospects. The announcement was made during Inman News Real Estate Connect, a leading real estate and technology conference meeting in San Francisco this week. "Apps have become an important marketing and relationship building tool for Fortune 500 companies. Now, for the first time, real estate agents can leverage the power of apps in their own business without the expense. The new apps deliver practical value to home buyers and sellers while helping agents nurture relationships," said Renwick Congdon, chief executive officer of the Seattle-area real estate marketing software firm. For one of its first apps, Imprev has teamed with leading provider of traffic information and driver services INRIX® to offer an agent-created, all-device-compatible Drive Time Web app. 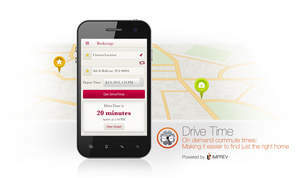 The new Drive Time agent app from Imprev leverages INRIX analysis of billions of data points from vehicles every day to provide homebuyers with insight into commute times from their workplaces and homes listed for sale at rush hour and throughout the day. "INRIX Drive Time makes it easier to find just the right home, offering consumers personalized insight into one of the more important purchase criteria -- their commute time to work," said Kevin Forman, GM, GeoAnalytics at INRIX, Inc. "Imprev's innovative App Generator and Drive Time web app extends the benefits of INRIX insight to millions of home buyers nationwide." Imprev also announced today that it is among the first companies to implement the latest innovation from neighborhood data leader Walk Score®. Imprev's new interactive Travel Time map visualization, powered by the Walk Score Travel Time API, shows how far you can walk, ride public transit, bike or drive within a given amount of time. Imprev is making this new mapping technology available as part of its mobile-ready, responsive Single Property Website product. "We are excited to be partnering with Imprev, an innovative leader, to bring our new Travel Time data and map visualizations to a broad market of home shoppers," said Josh Herst, Walk Score Chief Executive Officer. "Understanding your transportation times and options to the places you frequent is a key factor in deciding where to live. And now, via Imprev's Single Property Websites, potentially tens of thousands of real estate agents and brokers are empowered to better inform millions of home buyers." INRIX is one of the fastest growing big data technology companies in the world. The company leverages big data analytics to reduce the individual, economic and environmental toll of traffic congestion. Through cutting-edge data intelligence and predictive traffic technologies, INRIX helps leading automakers, fleets, governments and news organizations make it easier for drivers to navigate their world. Our vision is simple -- to solve traffic, empower drivers, inform planning and enhance commerce. Whether through an in-car or smartphone navigation application, a local newscast or our INRIX Traffic app, our up-to-the-minute traffic information and other driver services reach more than 150 million drivers to help them save time, fuel and frustration. INRIX delivers traffic and driving-related insight, as well as sophisticated analytical tools and services across six industries covering over two million miles of road in 32 countries. For more information visit us at www.INRIX.com. Walk Score® believes that walkable neighborhoods with access to public transit, shorter commutes, and proximity to the people and places you love are the key to a happier, healthier and more sustainable lifestyle. Walk Score delivers more than nine million scores for apartment and home addresses per day, across a network of more than 20,000 real estate sites. According to independent research conducted by CEOs for Cities, one point on a Walk Score can add $3,000 to a home's value. To find your Walk Score, enter your address at www.walkscore.com. Imprev, Inc. enables real estate companies to build Marketing Centers and web applications on the industry's most advanced marketing platform. The Imprev platform serves more than 150,000 real estate agents worldwide. Imprev provides the industry's only mobile-ready Marketing Centers that fully work on desktop, laptop, iPad or Android tablet. Imprev offers a broad set of custom and "better than white-label" solutions for brands, brokers, agents and teams. Established in 2000, Imprev is headquartered in Bellevue, Wash., and is online at www.imprev.com.